On Saturday 15th October the Felix Dexter foundation/ charity pays homage to one of its very finest. Artists from the world of television, music and comedy come together to celebrate the life of the late great Felix Dexter who sadly died in October 2013. Felix was a much loved and respected performer who was taken away from us at such an early stage. 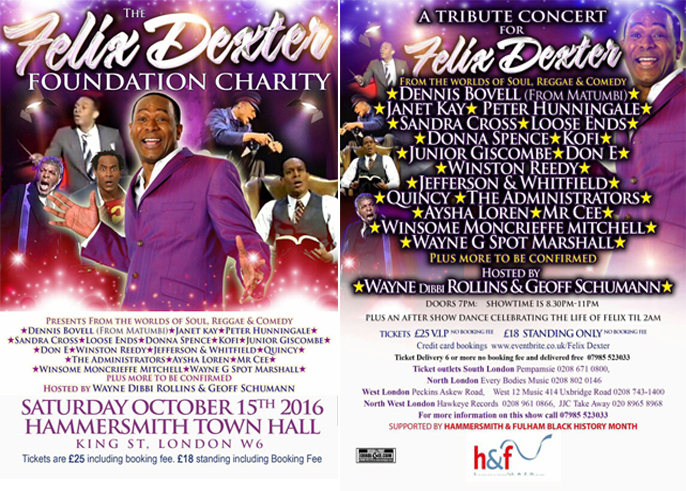 A tribute concert has been organised in conjunction with the Felix Dexter charity and memorial foundation. A number of well established performers from within the African Caribbean community from the worlds of radio, television, music and comedy have come together and all agreeing to donate their time for this very special cause. All of this will be in the presence of the St Kitts high commissioner.